Field Ops — RECON, Day 2 of 4: Meet Your Makers. Ballistic Nylon, Leather Strap, TiGr5 | Redux & Co. The strap makers run the ballistic nylon through this laser machine that slices the clean ends and burns the tongue holes for each piece. 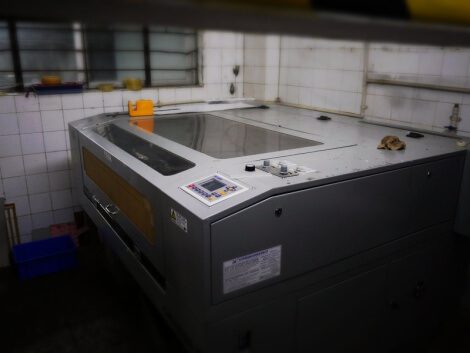 Every single one of our straps will emerge from this machine. Next, the straps are hand sewn using a guide to protect the hardware and speed the stitches. This guide is for the buckle shoulderless spring bar and the hardware keeper on the under wrap. This guide is for the double hardware beneath the buckle. I couldn’t believe how careful our workers are. 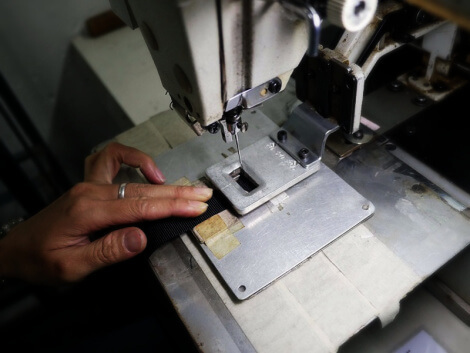 Workers apply protective films by hand to each hardware loop and buckle to PROTECT the TITANIUM from scratches from the guides and sewing machines in the stitch process! In this factory I saw many “big” brands on the line. We’ve had to execute an evasive maneuver on the leather mil-straps. As part of our due diligence process, our ground crew requested documentation from each of our manufacturers to certify human safety standards. There’s all kinds of safety issues that we need to be vigilant about. 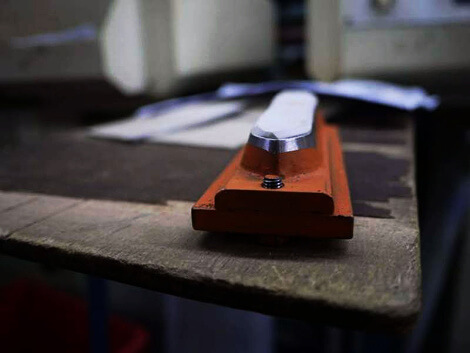 From the supremely caustic solution that etched our bezels, to wood box fumigation, to the dyes used in leather. Some dyes used to color leather are quite toxic. And that’s not something we were willing to negotiate or budge on. The original manufacturer of the leather mil-strap at first refused to supply the proper certificates. Eventually, they relented when we threatened to find a new source. They told us the certification would be supplied with the first production wave. Fine. An added complication is that they were located too far from all the rest of our manufacturers and it became clear once I was on the ground there was no way I’d have time in 4 days to visit them in person. So, we requested they have the final production prototypes with our new hardware shipped to our location. When I arrived, the items they sent to us clearly had been harvested from previously sewn straps. 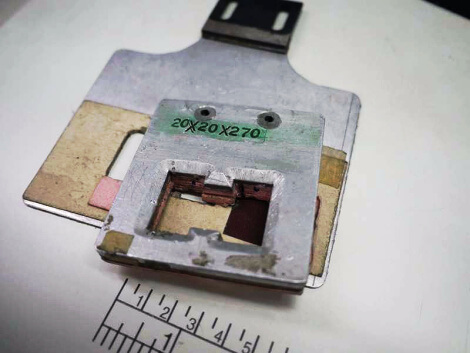 They had simply cut the stitches out to remove hardware from existing inventory. When we demanded an explanation, they said that they were not able to source new leather as we spec’d. I couldn’t believe it. I conferred with our field agents and they told me we could meet with a top strap maker with over 30 years of reputable work to see whether they could help divert our plans. After reviewing some leather samples and touring the operation, I felt confident they could deliver. 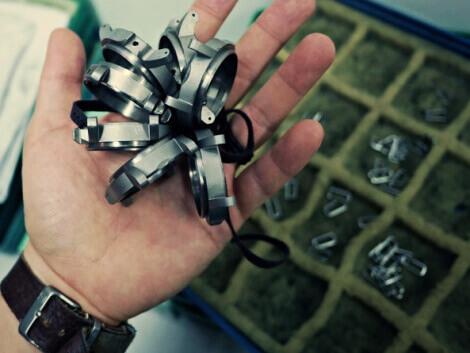 However, since we had to start from scratch with them, they estimated 4 weeks for production. That puts a damper on our plans to ship everything by early December, but they’ve promised to deliver in waves as straps roll off the line, so I’m hoping for earlier. Orders that don’t include leather straps will still ship in early December. Obviously, I wanted to be able to visit every manufacturer while our goods were on their production line, but as you can imagine, that wasn’t always possible. This is a die that slices the leather shape. 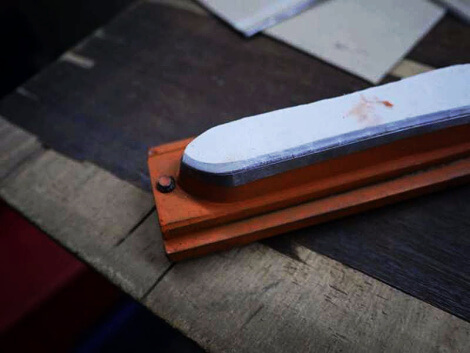 In the center of the die is a dense foam that protects the face of the leather from the pressure of the chop. The blade of the die is quite sharp. 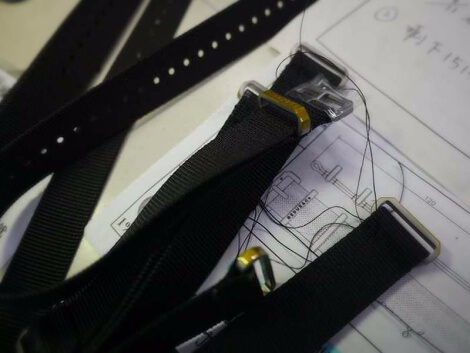 I was surprised (sort of) to see the different processes for making various types of straps. Our straps are straight forward compared to some “luxury” brand straps that often use a really thin piece of leather padded with a type of spongy material, which is sandwiched between another thin slice of leather. There’s a lot of glue and shaping involved. How do I know this? I saw them made and stamped with brands you’d recognize right away. Most of the leather straps come out of the this machine. Not ours — because our mil-strap is very long, it requires a special machine. 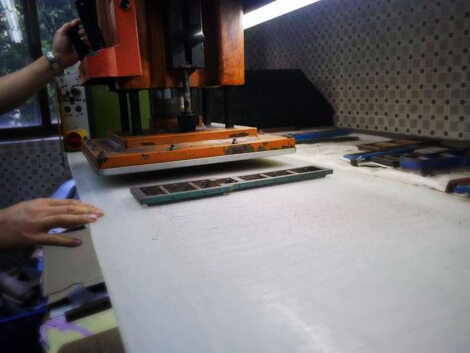 Meet the mother of all leather cutting machines. While this manufacturer had rooms full of the smaller machines above, they only had one of these. This thing could cut really long slices of leather. When it comes to cutting leather for straps, it’s critical that equal pressure is applied across the entire cutting surface. That’s why there’s such large face plate. The worker who runs this behemoth has worked with leather for 25 years. 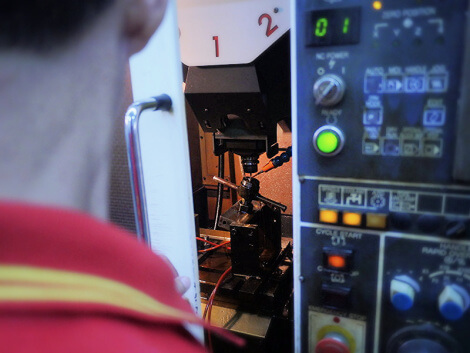 This is a 3-axis CNC machine in the process of carving out a prototype. I had some corrections that needed to be made. Specifically, they needed to adjust the spacing of the crown guards. Do you see that blue and orange nozzle to the right of the work area? Did I mention that these CNC machines all spray copious amounts of an oil solution to keep the drill bit from overheating. The stuff splatters everywhere. Here are some titanium grade 5 cases. Each of these had defects. One of the stem holes was off-center. Another had a lug over-machined, another had a defect in the strap allowance curve. When I asked if this was typical, there were lots of grunts and groans. TiGr5. Our field agents reminded me time and again that dozens of manufacturers refused to work with TiGr5. Three brave manufacturers said they would try. One outright refused after he broke a CNC machine. Another quoted an astronomical price. And then there was one — ours. And yes, in the background is our strap hardware awaiting sandblast. Those actually were made in another factory that I did not have enough time to visit. 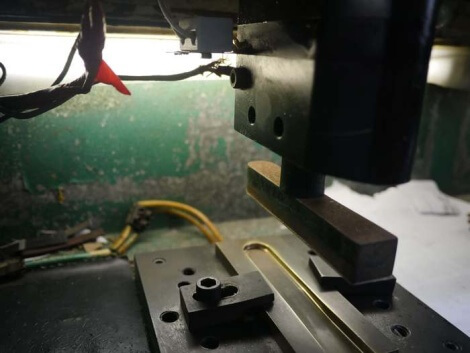 More on TiGr5 manufacturing adventures in our next episodes. Can’t wait to show you what’s next, it was pretty much a highlight of my trip. Tackle your missions this week, and Godspeed. elbert, over and out. 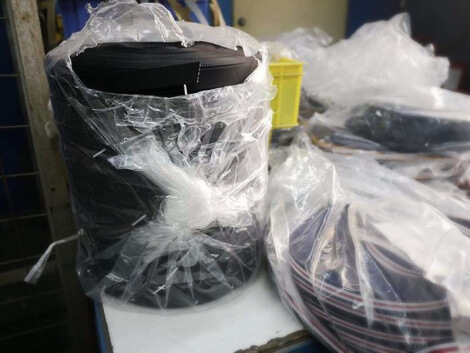 This entry was posted by pilot in Life Skills, News and tagged ballistic nylon, CNC, documentary, factories, leather, makers, manufacturing, titanium, titanium grade 5.